Get Your Small Tripawds Bandanas, Finally! You’ve been asking for it and we finally did it! Three-legged cats, and small but mighty Tripawd dogs can now fly their Tripawd flag with pride! Tripawds Bandanas Are for Everypawdy! You know and we do too that four and three-legged cats couldn’t care less about making a fashion statement. But when Purrkins‘ mom wanted him to fly his Tripawds flag, we knew something had to be done. It was just a little too big for kitties of any size, don’t you agree? 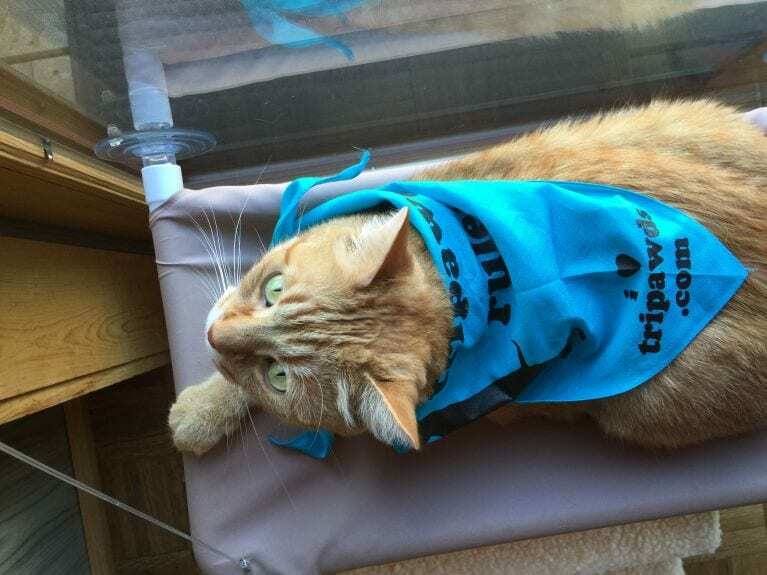 See how crazy a big Tripawds bandanna looked on him? Yikes! “I don’t like capes!” says Purrkins. Holly and Purrkins, thank you for the kick in the pants we needed to better meet the needs of ALL Tripawds members. 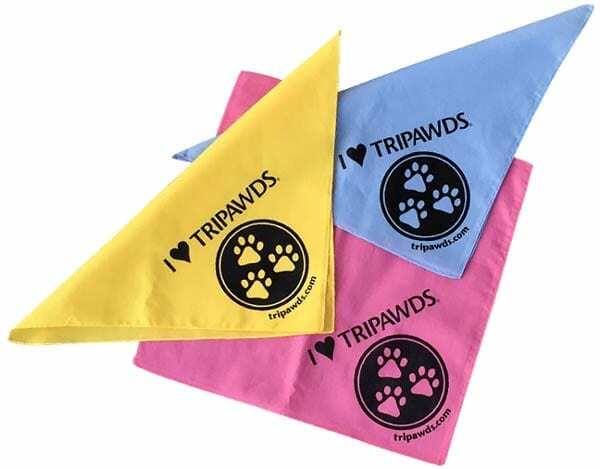 We now have Small “I Love Tripawds” bandannas in pink, blue and yellow. As always, we understand that members face crazy vet bills. So just contribute what you can for a small “I Love Tripawds” Bandanna. The small bandanas are square and they are 14 x 14 inches, versus the large ones that are 22 x 22 x 30 inches. They’ll fit any Tripawd from the most petite kitty to a Pug or other small dog. Thank you so much. All proceeds help offset the costs of keeping the Tripawds Nation online! GREAT!! But Purrkins looks cute in anything! !